Thursday 2 June 2016, 4.00 – 6.30 p.m.
All welcome, no booking required. Seats available on a first-come, first-served basis. Drinks will be served after the seminar. Fashionable Diseases: Medicine, Literature and Culture, ca 1660-1832 is a three-year, Leverhulme-funded research project at the Universities of Northumbria and Newcastle. In this seminar, hosted by the Diseases of Modern Life project, team members will showcase some of their research through short presentations followed by discussion. Presentations will include the paradoxical fashionability of gout and rheumatism, the roles of gender, class and health professionals in fashioning fashionable disease, to the manner in which treatments and their locations were implicated in the fashionability or otherwise of disease. The seminar will also consider the crucial role of representation and genre in the creation, maintenance and decline of fashionable disease. Dr Jonathan Andrews and Dr James Kennaway (Newcastle University). Gout and rheumatism as female maladies: the advantages and disadvantages of fashionable diseases from the sufferer’s perspective in Georgian Britain. Professor Clark Lawlor (Northumbria University) ‘On Fashion in Physic’: the feminisation of fashionable disease in the very long eighteenth century. Ashleigh Blackwood (Northumbria University) – ‘The most sudden and dreadful hysteric, or nervous disorders’: Women, Fashionable Diagnosis and Remedy. Professor Allan Ingram (Northumbria University) Doctoring the Doctors: In Fashion and Out? Dr Leigh Wetherall Dickson (Northumbria University) Delusions of Grandeur/ Illusions of Disease. Dr Anita O’Connell (Northumbria University) Sociability and Disease at the Spas: Satires of a Hypochondriac Society. In his book on machines and modernity in India, historian David Arnold rightly points out that ‘big technologies’ like the telegraph and the railways have received more attention from scholars than smaller, ‘everyday technologies’ like the typewriter, the bicycle, the sewing-machine and the rice mill. Following the trajectory of these four technological devices in India, Arnold makes some pertinent comments about the nature of colonial power and its ability to control the use of technology, the relationship between technology and well-being and the myriad ways in which these modern contrivances were incorporated into the daily routines of Indians of diverse social backgrounds. I am always reminded of Arnold’s book when flipping through the pages of technical and more general periodicals from the nineteenth century, marvelling at the great variety of technological innovations put forward by the engineering minds of the day. One example I have recently stumbled upon is the ‘electric stair-climber’ or the monte-escalier, as it was known in French: a stairlift devised by the civil engineer J. Alain Amiot, which was among the many ‘novelties’ exhibited in the Gallery of Machines at the Exposition Universelle held in Paris in 1889. Describing the invention, Le Génie Civil highlighted the relevance of this ‘small technology’ to everyday life: ‘In addition to the great industrial inventions, there are numerous other, of a more modest type, which are no less important to our daily needs and which provide us with a host of services whose necessity we have come to appreciate more every day’. Elevators were already familiar to Parisians at the time when the monte-escalier began to vie for the attention of the public. They were particularly useful in ‘modern’, multi-storied buildings, where residents and visitors who used them were spared the ‘fatigue of climbing of stairs’. Le Génie Civil even claimed that the use of elevators was connected to a rise in preference for upper-story apartments, where air was ‘healthier and the dust and noise of the street below could not reach so easily’. The electric stair-climber resembled the elevator in many respects and press accounts of Amiot’s invention were careful to emphasize the fact that the new technology was by no means intended to compete with the former, but was much less ambitious in scope. The stair-climber was designed for use in buildings where the transport of persons was limited, such as private residences, or where it could complement the use of the elevator, for example in hotels. Unlike the elevator, which could transport people from the ground floor to the top of the building, the stair-climber was envisaged for use between floors, with each climber functioning independently from the ones on the other floors. Also unlike the elevator, a stair-climber could only be used to transport one person at a time, either standing or seated. Among its advantages were a lower price and the compact design: much like contemporary stairlifts, Amiot’s monte-escalier could be folded when not in use and it only occupied approximately 30 centimetres of the total width of the stairs, thus enabling people to pass by each other without exposing themselves to the danger of accidents. Another advantage was the fact that stair-climbers could be easily installed in older buildings that did not have enough space to accommodate the bulky cage of elevators. Unlike this more elaborate contrivance, a stair-climber consisted of only three parts: a ‘guide’ made of two parallel flat iron rods which were supported on the balustrade, a movable platform and a motor. Although the motor could be either electric or hydraulic, like in the case of elevators, by this time there was a visible move towards the use of the former type of device. As one press report pointed out, in the case of elevators, this trend could be traced back to the International Exhibition of Electricity held in Paris in 1881, when proposals were made for the replacement of hydraulic engines with electric ones on elevators. One intriguing aspect of these early French reports about the monte-escalier is that they make no mention of the potential use of this innovation to assist the mobility of elderly or disabled people. Indeed, it is unclear from the available evidence whether Amiot had envisaged such a field of use. But as news of his invention spread to other corners of the globe via the medium of newspapers and magazines, people began to speculate that the device could also be useful to those afflicted by mobility problems. Across the Atlantic, the editor of the Manufacturer and Builder of New York ended his description of the ‘electric stair-climber’ by anticipating that, ‘The increasing facilities for employing the electric current for power, should render a device of this kind practicable on the score of cost, and it will doubtless prove to be useful and popular in many situations. It would be particularly valuable for invalid members of a household.’ This prediction proved true, as the advertisement below, dating from 1933, also demonstrates. Unlike the earlier French models, the ‘electric passenger lift for the home’ designed by the Inclinator Company of America was aimed specifically at “all who are afflicted with ‘polio’, impaired heart action, arthritis, and the infirmities of age. Where physical disabilities make stair-climbing distressing or tiresome these modern conveniences are a necessity, permitting the invalid to avoid painful and fatiguing efforts.” The design of the American stairlift was similar to that of its predecessor and, indeed, to contemporary stairlifts that have become indispensable in the care of the elderly and the disabled. Our programme for Trinity Term is now announced with three seminars taking place at St Anne’s College. Sydney Padua is an animator and graphic artist, whose graphic novel The Thrilling Adventures of Lovelace and Babbage won the British Society for the History of Mathematics Neumann Prize, the British Book Design Award and was a finalist in Goodreads Best Graphic Novel. Unusually for a graphic novel, The Thrilling Adventures is heavily footnoted, and combines detailed research with the creation of an alternative reality in which Ada Lovelace and Charles Babbage join forces to complete the world’s first computer, the Difference Engine, whilst embarking on a series of wonderfully illustrated adventures which involve major cultural figures from the Victorian period. In this talk, Sydney Padua reflects on Lovelace and Babbage’s achievements, her own creative interpretations, and visions of his Analytical Engine. According to a famous formula going back to Immanuel Kant, the late eighteenth and early nineteenth centuries saw the transition from natural history to the history of nature. This paper will analyze changes in the institutions, social relations, and media of natural history that underwrote this epochal change. Focussing on the many posthumous re-editions, translations, and adaptations of Carl Linnaeus’s taxonomic works that began to appear throughout Europe after publication of the tenth edition of his Systema naturae (1758), Dr Müller-Wille will argue that the practices of Linnaean nomenclature and classification organized and enhanced the flows of data—a term already used by naturalists of the period—among a wide range of amateur and professional naturalists and associated institutions in new ways. Species became units that could be “inserted” into collections and publications, re-shuffled and exchanged, kept track of in lists and catalogues, and counted and distributed in ever new ways. On two fronts—biogeography and the search for the “natural system”—this brought to the fore entirely new, quantitative relationships among organisms of diverse kind. By letting nature speak through “artificial“ means and media of early systematics, Dr Müller-Wille argues, new powerful visions of an unruly nature emerged that became the object of early evolutionary theories. 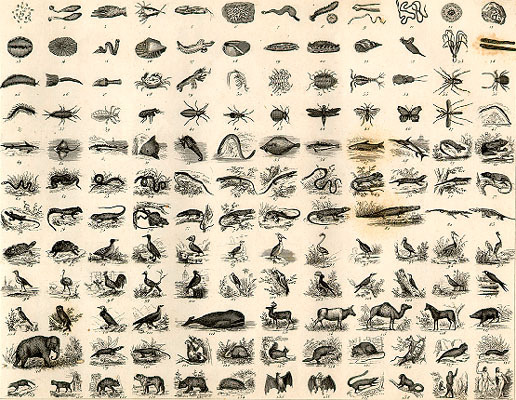 Classical natural history as an “information science” held the same potential for generating surprising insights, that is, as the experimentally generated data of today’s data-intensive sciences. Conference registration is now open for Medicine and Modernity in the Long Nineteenth Century, to be held at St Anne’s College on 10-11 September 2016. Registration and more information is available here. 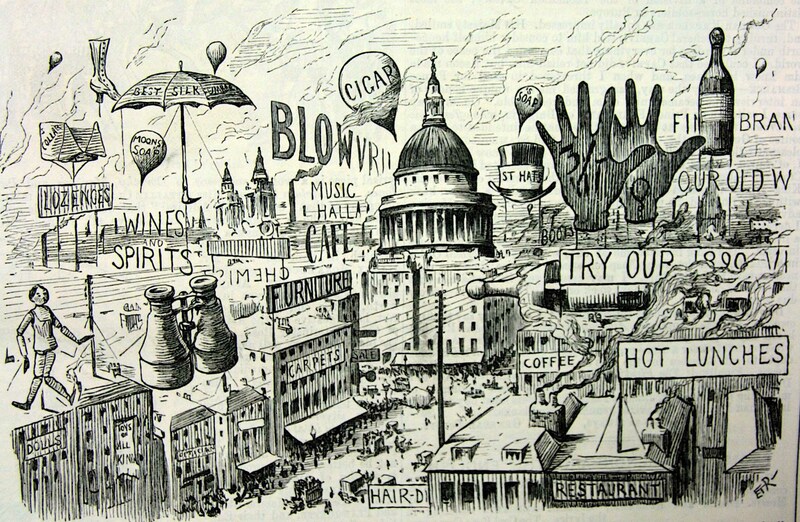 ‘Picturesque London – or, sky-signs of the times’, Punch, 6 Sept 1890. In this two day interdisciplinary conference, hosted by the ERC project Diseases of Modern Life: Nineteenth Century Perspectives, we will explore the phenomena of stress and overload, and other disorders associated with the problems of modernity in the long nineteenth century, as expressed in the literature, science, and medicine of the period. By tracing the connections drawn between physiological, psychological and social health, or disease in the era, we aim to offer new ways of contextualising the problems of modernity facing us in the twenty-first century. We are particularly interested in comparative perspectives on these issues from international viewpoints. Registration: Conference registration is now open and online bookings can be made here. If you are presenting at the conference, please ensure that you use the Speaker Registration link. The standard registration fee is £35. The student/concession registration fee is £20. The fee includes lunch and refreshments on both days, and a drinks reception and dinner on Saturday evening. Registration closes on Friday 19th August 2016. Conference Programme: The full programme is available here. Contact: For all enquiries, please contact medicineandmodernity@ell.ox.ac.uk. Venue: Ruth Deech Building, St Anne’s College, Woodstock Road, OX2 6HS. Information on travel to Oxford and St Anne’s College is available here. Accommodation: A limited number of single en-suite rooms are available at St Anne’s College for the nights of Friday 9th and Saturday 10th September. If you wish to stay at St Anne’s for one or both nights, please book as soon as possible. Bookings can be made via the conference registration link above. The rate is £75.00 per night for bed and breakfast. University Rooms, Accommodation in University of Oxford Colleges. The Bodleian Library is one of the oldest libraries in Europe and although it has expanded over the years to accommodate growing numbers of readers, its central and oldest buildings remain intact. The Library runs a number of tours, including glimpses inside the 15th-century Divinity School and the medieval Duke Humfrey’s Library. The recently renovated Weston Library (across the road from the Old Bodleian) also hosts regular exhibitions of rare materials from the University’s collections. The Oxford University Museum of Natural History, founded in 1860, houses the University’s collection of zoological and geological specimens within a stunning neo-Gothic building. Don’t miss the Pitt Rivers Museum, accessed through the back of the Natural History Museum, which contains three impressive floors of ethnographic and archaeological objects, including musical instruments, masks, and amulets. The University’s Botanic Garden is the oldest in Britain, and is still used as a teaching resource in the biological sciences. The Garden includes both scientific and ornamental collections – the former including a Medicinal Collection – and several glasshouses. The Museum of the History of Science houses an extensive collection of scientific instruments, from astrolabes to photographic equipment. The Museum also runs regular volunteer-led tours for visitors. The University Parks are an oasis in the heart of the city, bordered by the River Cherwell. As well as offering a vast space to relax in the Parks include the ‘Genetic Garden’ dedicated to Oxford Professor of Botany Cyril Dean Darlington, which highlights the diversity and evolution of the plant kingdom. The Ashmolean is the University’s museum of art and archaeology, containing a huge variety of objects from Egyptian ceramics to the famous Anglo-Saxon Alfred Jewel. Special exhibitions during September include ‘Monkey Tales’ to celebrate the Year of the Monkey in 2016 and ‘Storms, War and Shipwrecks’, investigating underwater archaeology. Our latest offering is a guest blog post from Mary Chapman, a KCL graduate who will shortly begin her PhD at Leeds. Her doctoral thesis will focus on the impact of gendered psychological medicine on urban women, 1845-1900, and in this post she gives us a fascinating account of just one of these women: author Amy Levy. Urbanisation increased dramatically during the mid-to-late 19th century, and modernity became synonymous with the swelling cities. To many, this evoked a growing anxiety; old traditions and morality were being thrown off in favour of new codes, new laws, and new ways of living that destabilized Victorian society. These changes were inextricably linked to urban centres, where sprawling populations and poor conditions highlighted the need for reform and fostered progressive communities. This was especially the case amongst women, many of whom found that, in cities, they could lead lives outside of the domestic sphere. However, these independent, working women posed a threat to established gender roles, and so – it was thought – to their very biology. The topic of modernity and its influence on sanity was the focus of much discussion amongst late-Victorian mind doctors. Eminent physicians such as Henry Maudsley, John Bucknill, and Daniel Tuke believed that the uncertainty and competition intrinsic to metropolitan life increased the likelihood of mental illness. Bucknill and Tuke, in their influential Manual of Psychological Medicine, argued that ‘civilisation, with its attendant knowledge and education, creates social conditions […] which of necessity involve risks (to employ no stronger term) which otherwise would not have existed’. They saw mental disease as the pathological result of the undue application of the brain to tasks outside of its usual capacity. In neglecting their ‘natural’ role as wives and mothers, women were forcing their bodies and minds to work towards entirely unsuitable goals. Doctors feared that this would lead to exhaustion, disease, or worse: madness. The physical changes inherent in female biology were thought to cause mental imbalance if not properly managed; any energy expended in pursuits other than the domestic could result in tragedy. Modern life, by its very nature, presented many dangers to female psychology. The suicide of Amy Levy in September 1889, at age 27, appeared to be just such a case. Levy, a young woman writer very much a part of the London literati community, suffered from depressive episodes throughout much of her adult life. When in the capital she resided at the family home in Endsleigh Gardens, and socialised with a mixed set of social reformers, artists, and writers. Educated to university level, Jewish, and single (her sexual preference was for women, but she struggled to form lasting attachments), Levy identified as a woman on the fringes of conventional society. Living on the margins of many communities, she must have felt at a loss to know how to belong. Levy’s writings, along with her heart-wrenching letters to friends like New Woman Clementina Black, suggest that she was suffering from some form of depression. In a note written in the year of her death, she cries ‘O Clemmy, Clemmy, is everybody’s life like this? I ought to have made something out of mine, but it’s too late […] [I am] dragging round all day, crying half the night.’ Levy appears to have felt a strong relationship between her unhappiness and her life in London, writing despairingly to Black, ‘I wish I were never coming back [to London] but I am in for another 60 years.’ She was at her most cheerful when travelling on the Continent with friends, and although she returned to a loving family and busy social network in the capital, the strain of modern life – with its demands on her writing, and the tax on her energy levels by the rota of parties and calls – was exhausting. Above all, London brought into sharp relief her sense of disconnection from other people. However, Levy’s depression was categorised in a very different way by her contemporaries. Gossip about her suicide, as Judith Wilson notes, was ‘constructed in the terms of the time’. Her death caused a minor sensation amongst the intellectual set in London, and many notices ran in the papers speculating about the circumstances. Her peers blamed her lifestyle and heritage, or situated her within a romantic, literary tradition of over-sensitive, nervous youth. Most of all, she was seen as a beautiful, lonely – and therefore vulnerable and tragic – woman. As Bucknill and Tuke had warned, Levy had, it seemed to some commentators, run a risk that in the end proved too great. She had fallen a ‘victim [to] the pressures of emancipation’.